Magic is the only art form in the world that brings you back to that child like feeling of "HOW DID HE DO THAT"
• Sets your function apart from any other. • Magic puts your guests at ease before or during the event. • A way of stimulating conversation between strangers. After your guests have arrived Mr Magic will mingle amongst your guest and perform close-up magic at its best. This will provide the perfect opportunity to set your guests at ease and looking forward to the events proceedings. With Mr Magic's warm personality and sense of humour mixed with a dash of wonder, no one can help but stand amazed. This is extremely ENTERTAINING highly recommended for groups of 10-200. This is performed with a table while standing. This is a 45 minute inter-active magic show that involves all the audience members. Oversized props are used that will leave everyone laughing for hours. • Spike is a fluffy raccoon animal that will make his appearance time and time again,to bring wonder and excitement to children and even have a few surprises of his own. • Balloons are twisted and folded in all different shapes and sizes. 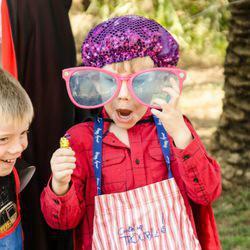 • The GREAT TABLE CLOTH STUNT, imagine pulling a table cloth out from underneath a fully decorated table with cutlery plates, side plates cups and saucers. This is a highly interactive boot camp style party game, designed to teach kids the value of team building and problem solving, everyone is involved and has a part to play. Kids are divided into two opposing groups, red team and blue team. The goal is team work. The Game is based on a point system where teams progress in the game by gaining points after winning activities. Duration is 60 minutes. This is a companion to boot camp, it is a 30 min extra party game that follows right after Boot Camp. The two teams play an exciting rotating water game where kids interchange between the bench and field. The game involves massive water guns. Activities are designed to be played in sets of half ‘n hour each. Boot Camp is booked for 60 minutes and Water Wars is an extra 30 minutes. 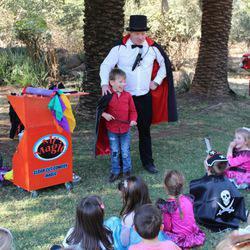 15% off Mr Magic entertainment for your kids birthday party. Joburg Area, normally R1600 Pretoria Area, normally R1800 Subject to availability. 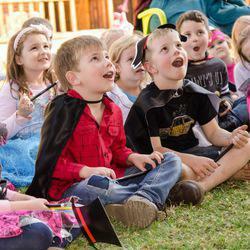 We booked Mr Magic on the 31st of March for our sons 5th birthday party, and he was without a doubt absolutely incredible. He really kept the kids as well as the adults entertained. All our family and friends said that their kids had so much fun!! You won’t be disappointed if you book Mr Magic!! Werner, thank you so much for making my son's 6th Birthday so memorable. I can really recommend you to ANYONE who would want a master magician to entertain the kids AND adults I can really recommend Werner.